Reading and knowing the Exodus TCG storyline is a game-enriching experience that ties both the cards you play, and you as the player into it! The types of decks you use in real life sanctioned events affect Exodus' Guild Wars and may determine certain outcomes for the guilds at any point in the story. Because Exodus cards don't have any flavor text printed on them, this is your way to submerge into the unique, fantastical world of the Exodus TCG and escape into the ever-changing lands of Eeventide! Years ago, swirling whirlpools of color began appearing across the world. These mysterious portals, shortcuts from one place to the next, led people to a new world called Eeventide. This new planet in another dimension, previously devoid of life, welcomed sentient beings. The natural order of things was different; a phenomenon known as the Thoughtstream, a colorful sky river that seemed to be a mix of Aurora Borealis and thick, bright smoke loomed overhead along with limitless stars and galaxy nebula. It tethered humans to the planet by some unseen force. An alien metal made of a strange magical compound bonded itself to each and every person’s arm who crossed through the portals, covering their shoulders all the way to their fingertips. These mechanical arm contraptions became known as Helvers, and with them, humans became referred to as Drifters. 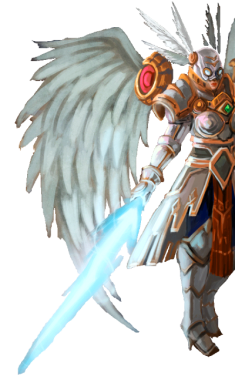 They acquired the power to levitate, to drift freely across Eeventide’s many landscapes, and most even learned to fly. The new laws of physics, or lack thereof, allowed Drifters to forge cards from stardust; cards that would allow them to summon massive creatures to battle. Dive in to the Exodus TCG storyline chapters below! Each new expansion to the game brings a set of new story chapters with it, which are first released in official Magazine issues. When a new Magazine is released, the previous issue's storyline will be added here. 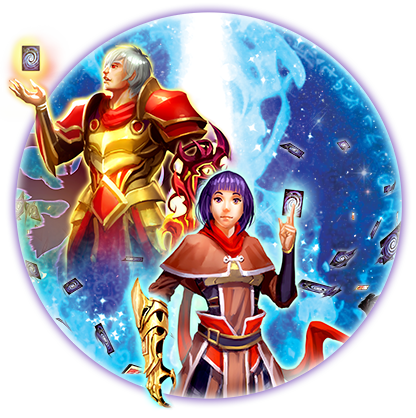 Be sure to keep an eye out for new additions to this page as the Exodus TCG storyline continually expands!